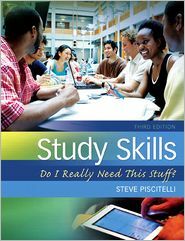 ← (#85) Study Skills: Do I Really Need This Stuff? What is common sense is not always common practice. As a skill, critical thinking is a no-brainer; especially in a democratic society. Yet what is common sense is not always common practice. Today, let’s examine a model that will help us be more effective critical thinkers. 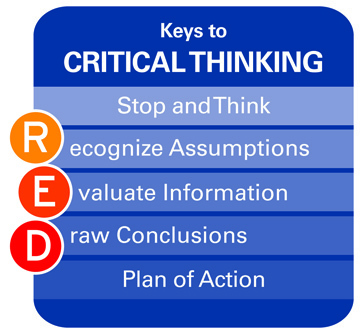 The RED Model is an effective and powerful critical thinking tool that provides a systematic, step-by-step process for examining issues, events, people, and problems. It is eloquent in its simplicity. The graphic below clearly outlines the steps of the model. Watson-Glaser Critical Thinking Appraisal, Forms A/B (WGCTA). Copyright © 2007 NCS Pearson, Inc. Reproduced with permission. All rights reserved. “Watson-Glaser Critical Thinking Appraisal” is a trademark, in the US and/or other countries, of Pearson Education, Inc. or its affiliates(s). For this blog post, let’s drill down and examine two vital concepts for this model–and for critical thinking in general. #1. Assumptions. An assumption is an inference, an opinion, or a belief about (among other things) a person, place, or philosophical position. Whether it is a wild accusation heard during political campaigns, differing expectations of a supervisor and employee, or a misunderstanding between two friends, an assumption can get us into big trouble. We must separate fact from fiction. Example. Ricky is a first-year college student. In high school he was given second chances on all of his quizzes and tests. If he did not score well the first time, he could always take it again. (Some school districts call this “grade recovery.”) He assumed his professors would do the same. Imagine his shock when he received a “D” on his first test—and was told what he gets is what he keeps. No mulligans! Strategy. In the book, Now You’re Thinking! (Chartrand, et. al.) the authors maintain, “Unstated assumptions are where trouble usually begins…their consequences can be serious.” (p. 66) Before we can do something about our assumptions, we have to recognize them. If we have become vested in our assumptions, it might be difficult for us to see that a particular opinion is full of holes. Ask a trusted friend or mentor to help you identify some of your operating assumptions. Then begin the task of indentifying fact from fiction. Activity. Identify one assumption in your life. If you are a student, what assumption have you made about your abilities in Math or in English? If you have a job, what assumption do you hold about your supervisor? Once you have recognized the assumption, gather and evaluate information that supports and refutes your inference. Then draw an objective conclusion–and decide on your next step. You may wish to ask for objective feedback from a mentor. #2. Confirmation Bias. This happens when we lean toward or agree with only information that confirms already held personal beliefs. We tend to overlook or dismiss anything that may challenge or disprove our opinion. Example. Tim Tebow, quarterback for the Denver Broncos (and former star for the University of Florida), has drawn legions of supporters and detractors about his ability to play in the NFL. Watch a talking head on television or read a social media post and you will generally find lots of confirmation bias. Those who love Tebow will overlook any shortcoming or misstep. Those who have continually criticized him ignore any good; they concentrate on the mistakes. Am I objective about this? Have I become so married to my opinion that I have become blinded to contrary evidence? How would I like it if this is how someone judged me? Activity. Examine one area of your life where you might be committing confirmation bias. It could be about political candidates you like (or dislike). It might be about a particular professor you have this semester. Maybe it involves a relationship that has become strained. Look for contrary evidence to your currently-held opinion. You may wish to ask for objective feedback from a mentor. For more information on the RED Model, see Chapter Two of my new book Study Skills: Do I Really Need This Stuff? 3rd edition (Pearson Education). Please visit my website (www.stevepiscitelli.com), contact me at steve@stevepiscitelli.com, or see order information at Amazon and Barnes and Noble. Enjoy your week—and H.T.R.B. as needed! Thank you for taking the time to read my blog post. Please pass it (and any of the archived posts on this site) along to friends and colleagues. You can also follow me on Twitter, LinkedIn, and Facebook. If you get a chance, visit my Facebook page (www.facebook.com/stevepiscitelli) and click on the “LIKE” button. Also, if you have suggestions for future posts, leave a comment. Have a wonderful week! © 2012. Steve Piscitelli and Steve Piscitelli’s Blog. This entry was posted in Critical Thinking, Study Skills. Bookmark the permalink. work? I’ve very little expertise in computer programming however I was hoping to start my own blog soon. Anyway, should you have any suggestions or tips for new blog owners please share. I understand this is off subject nevertheless I just had to ask. Appreciate it! It’s the little changes that will make the greatest changes. Thanks for sharing! Excellent web site you’ve got here.. It’s difficult to find high quality writing like yours these days. I seriously appreciate individuals like you! Take care! specific approximately my problem. You are amazing! Thanks for one’s marvelous posting! I actually enjoyed reading it, you are a great author.I will be sure to bookmark your blog and may come back later on. I want to encourage yourself to continue your great writing, have a nice weekend!